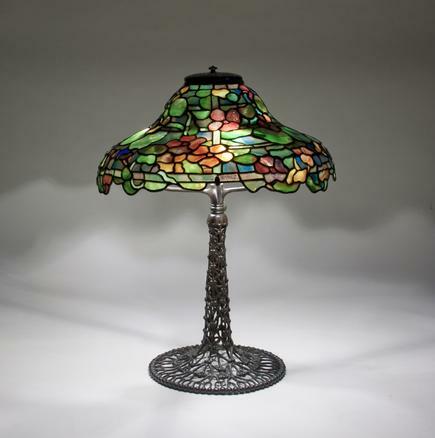 This early Tiffany Studios Nasturtium Shade, probably designed by Clara Driscoll, is one of only two known examples of the design; the other is in the permanent collection of the New-York Historical Society. The shade, featuring early mottled and streaky Tiffany Glass, is here paired with an unusual openwork bronze "Ginkgo Berry" Table Base with rich brown patina. This early Tiffany Studios Nasturtium Shade, probably designed by Clara Driscoll, is one of only two known examples of the design; the other is in the permanent collection of the New-York Historical Society. The shade, featuring early mottled and streaky Tiffany Glass, is here paired with an unusual openwork bronze Ginkgo Berry Table Base with rich brown patina.